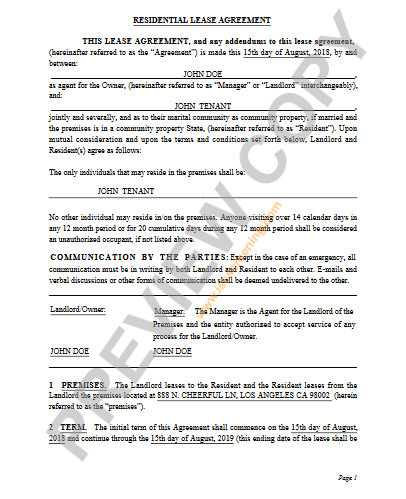 How do I prepare a lease agreement for a tenant? 1. Add the property address to your account. 2. Invite the tenant to complete the online application. Step 1: Prepare a preview copy of the lease. 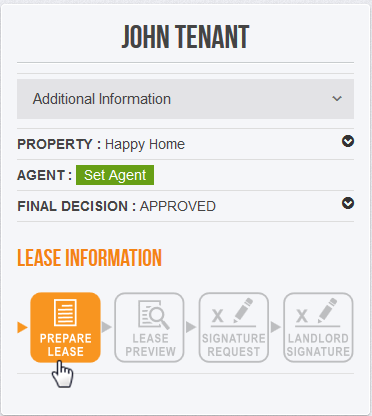 Click "Prepare Lease" on the home screen of your account. Find the desired tenant's name and click the button that says, "Prepare Lease," found under their name. You will have the chance to add additional signers and/or occupants on the next step. 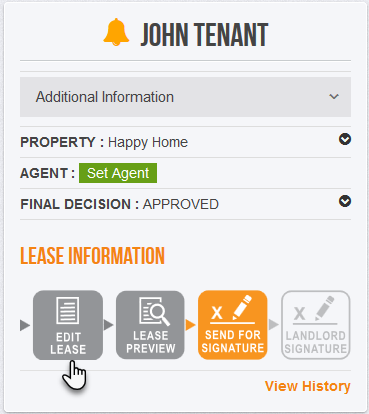 The property information you previously saved will automatically fill in most of the required fields for the lease. To edit any of this saved information, click the pencil icon and enter the desired changes. Lease dates, monthly rent amount, first months rent, security deposit amount, and any additional lessees or authorized occupants if applicable. Step 2: Preview the Lease, make any desired changes, and save again. Once you click "Save & Preview" a preview copy of the lease will open in a new tab. (If the lease does not open in a new tab please try disabling your browser's popup blocker, and click "Save and Preview" again.) The lease will have a “PREVIEW COPY” watermark until you send a lease signing notification to the tenant(s). 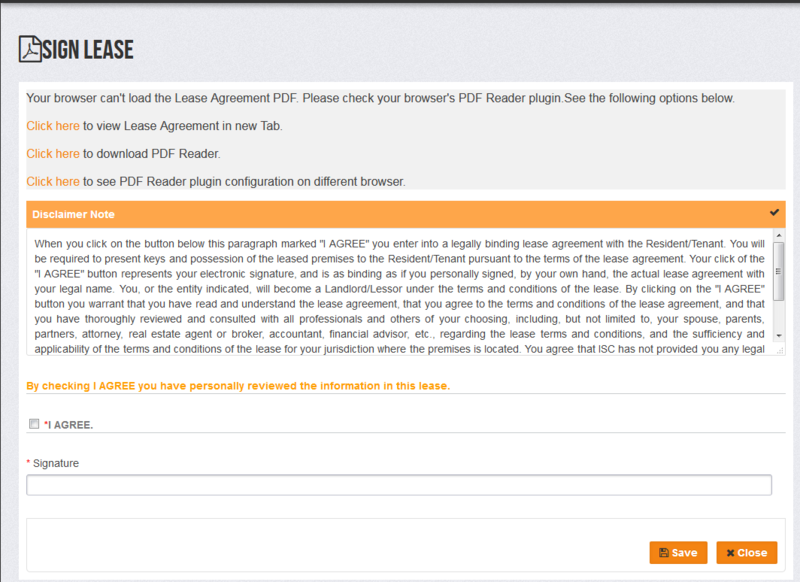 Each time changes are made to the lease you must check "I agree" box at the bottom of the page and SAVE again. If you need to continue the lease at a later time you can do so. Before you log out of your account remember to save any recent changes. 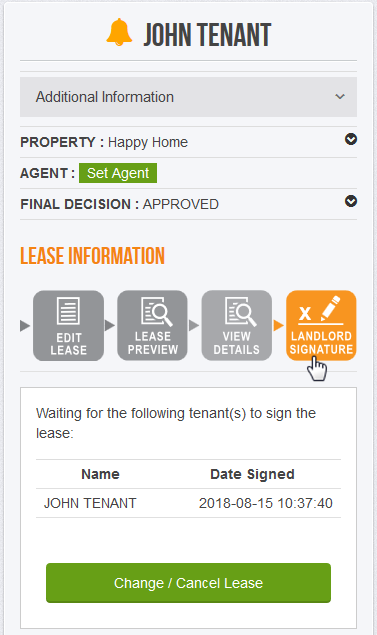 To continue the process log back into your account, click, "Prepare Lease," on the home screen and then click, "edit," underneath the tenants name. 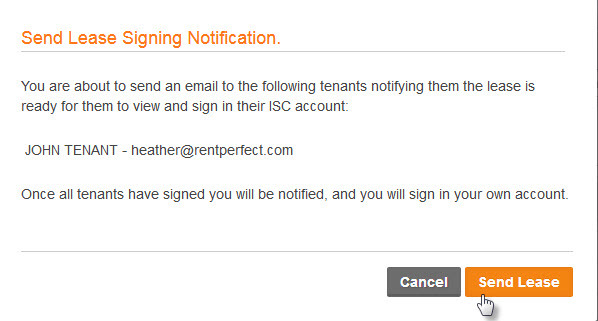 Step 3: Send a lease signing notification to the tenant(s). When the final copy of the lease is ready next must send a lease signing notification. Each tenant that is a signer must log into their Rent Perfect account to view and sign the lease agreement. 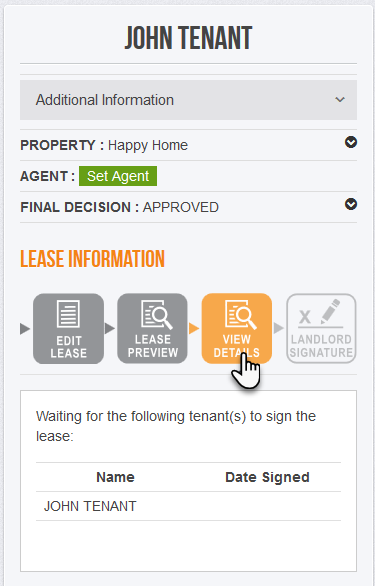 The lease is a "live" document and will up update with signatures automatically in both landlord and tenant accounts. You must give confirmation to send a lease signing notification. You will receive an email notification once a tenant signs the lease. You can also click, "view details," underneath the tenant's name to check the status the lease. Step 4: The Landlord signs the lease. Once all tenants have signed their part of the lease, now the landlord will sign the lease. To sign the lease click the button that says, "Landlord Signature." Type your name in the signature field to digitally sign the lease. Click, “Signed Lease,” to view, print or save a final copy of the lease. Rent Perfect will automatically store a signed copy of the lease in both the landlord and tenant portals. You can easily access a copy of the lease on your smartphone or computer. The landlord only has the ability to make additional changes to lease terms before the landlord signs their part of the lease. Once the landlord signs the lease no additional changes can be made. If changes are made to the lease terms after the tenant(s) have signed the lease, then the tenant(s) will be required to sign the lease again to agree to the most current lease terms. In order to terminate the lease early all parties must agree to sign a lease termination agreement. The landlord may choose to initiate the early termination agreement by clicking the appropriate button shown above, "Request to terminate lease."